This rug has been reduced from £19.99. I have it in my kitchen and I have just purchased another one. I found three in stock near me but be warned stock is low. Available in red too. HOME Honeysuckle Runner - 150 x 80cm - Red. Great was going to buy this anyway when it went down to £10. Got bigger sizes in this rug reduced too. Just ordered two - can't go wrong at that price. Has this got rubber backing? Just remember this is Argos and the quality is questionable. OK for kitchen use. Reserved one for kitchen, thanks. None near me, kind of good as I bought it just before Christmas for full price. Just remember this is Argos and the quality is questionable. OK for … Just remember this is Argos and the quality is questionable. OK for kitchen use. Had an argos one lasted years in living room,now used upstairs.Bought a new one from fancy shop in town for near 10 times the price and is fraying after a year.So not always the case.Only buying this though to save winter muck getting trailed in hall.£6 cant go wrong. Thanks op, managed to buy a couple in the larger size just before they went oos near me so very pleased. No it doesn't have a rubber backing. Lostkelly totally agree with you- Don't buy one bazmartin1234! I'm glad you've said that, cos I was obviously thinking of it! I bought the xl honeysuckle one in red and its nice and does the job. Its not very thick but for £18 its a bargain and worth it! ​ X) wouldn't that be the same scenario with another if the rug was replaced? Is there an easier way to find which stores have an item in stock than manually typing in lots of different postcodes? 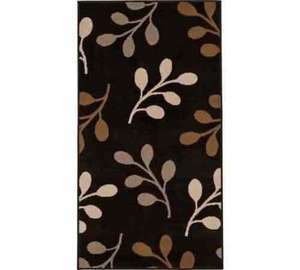 Just ordered the honeysuckle rug, brilliant deal. ​ X) wouldn't that be the same scenario with another if the rug was r … ​ X) wouldn't that be the same scenario with another if the rug was replaced? What are you doing that is so messy that you constantly have bits everywhere? Maybe if you clean the rest of the house before cleaning the rug. 10 times a day, sounds like you have OCD.